The anchor of Telefilm's strong governance is its Board of Directors chaired by Michel Roy, former provincial deputy minister and business management consultant. All directors are independent and have been appointed based on skill sets important to Telefilm, such as employment and intellectual property law, auditing and financial reporting, and marketing and communications. Regular attendance at meetings attests to the directors' dedication, commitment and involvement. The Governor in Council appointed Ram Krishna Raju of Ottawa to Telefilm's Board of Directors on May 14, 2010, for a five-year term. 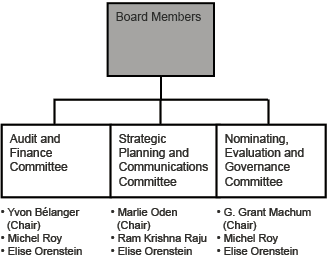 To facilitate its decision-making process, the Board has set up three committees. These committees deliberate on issues pertaining to their areas of competence and subsequently issue recommendations to the Board. Committee attendance is optional for directors who are not committee members. *Ram Krishna Raju replaced Michel Roy on this committee during the fiscal year. The Executive Director implemented a new governance structure in 2010-2011 to make Telefilm more efficient and to facilitate the decision-making process. 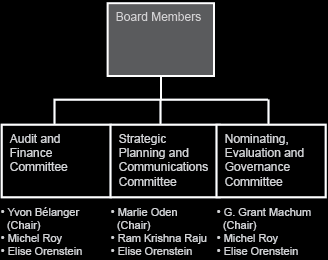 The Management Committee assists the Executive Director in making key decisions about strategic planning and organizational development, as well as administrative and operational issues. Telefilm's Management Committee has eight members from different sectors with relevant and complementary skills. Three sub-committees report to the Management Committee. The Human Resources Committee supports the Human Resources department in interpreting and applying the HR policies of Telefilm, and in determining and responding to non-standard situations. The Operational Committee makes decisions on matters involving various operational and administrative policies of Telefilm, as well as decisions that concern any specific issue, interpretation or situation with respect to standard practices. The Appeal Committee, chaired by the Executive Director, reviews decisions made by the Operational and the Human Resources committees that are being appealed by a client or an employee. 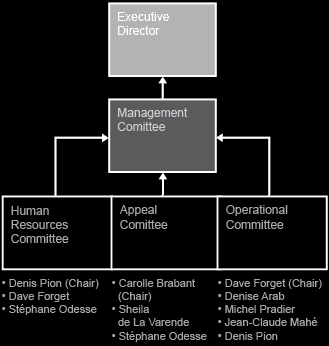 For 2010-2011, the committees' performances have been assessed by its members. Sound risk management contributes to a more efficient and flexible organization. 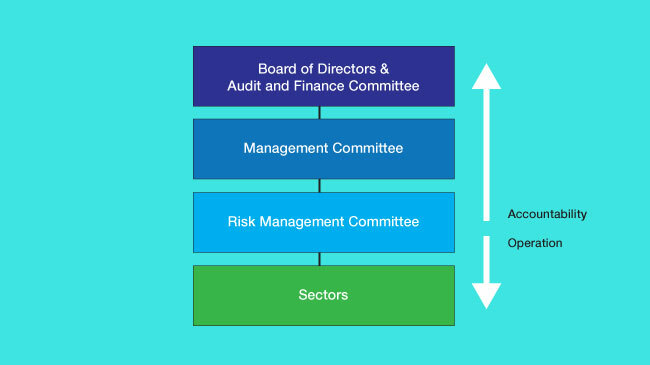 The Board of Directors and the Audit and Finance Committee approve acceptable risk thresholds and action plans to mitigate the organization's principal risks, and ensure that strategic orientations and risks are aligned. The Management Committee challenges the risk identification process and assessment, and approves action plans. The Risk Management Committee continuously monitors and assesses risks, recommends and implements risk mitigation strategies, and acts as a catalyst for change in matters regarding sound risk management practices. The risks that affect Telefilm can be related to strategy, operations, finance or compliance. Over the past few years, Telefilm has succeeded in reducing its operational, financial and compliance-related risks – a finding validated by recent internal audits. Risks that remain more material for Telefilm are strategic in nature. Industry may not find sufficient funding to sustain a critical mass of diversified products. Help Canada's audiovisual industry to become more competitive on the domestic and international scenes. 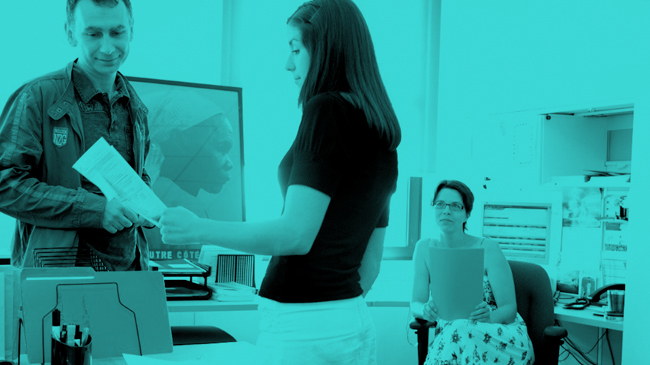 Simplify administrative guidelines, including increased flexibility for coproductions. Expand our role as a traditional funder by investigating alternative sources of funding for the industry. Follow-up on briefs submitted during the consultation on the implementation of Canada's Policy on Audiovisual Treaty Coproduction. Stimulating demand for Canadian products could prove difficult. Revamp activities which promote the industry's successes via different platforms. Redefine distribution and marketing assistance programs to take into account new market realities and digital shift. 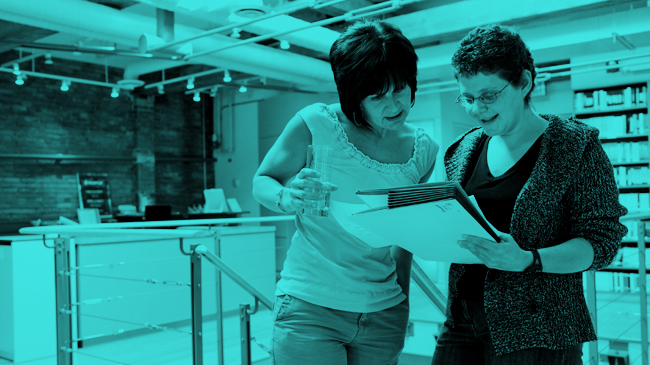 Consult the industry and the Canada Feature Film Fund Working Groups. Develop regional and international promotional strategies. Revise funding and support programs to better serve the industry's needs. Deficit reduction exercise could affect Telefilm's funding. Search for new funding sources and partnerships. Undertake ongoing discussions with PCH on innovative ways to maintain and/or facilitate the creation of new funding vehicles. Establish new partnerships at national and international levels. Difficulty in meeting client demand for a more flexible management approach. Consult the industry and conduct client surveys. Standardize and simplify program requirements. 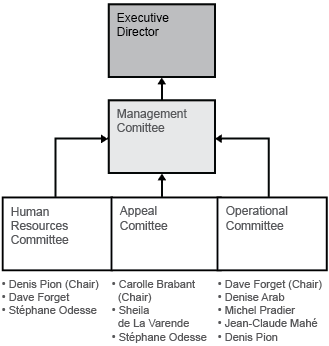 Creation of the Operational Committee. Streamline processes while maintaining an appropriate level of due diligence. CMF services agreement is renewed on a yearly basis. Steering committee in place to ensure that operations function well. Systematic and standardized production of reports. Maintain efficiency of program management costs. Client service approach/Regular meetings and outreach. Continually review processes to simplify management and maintain accountability. Consultation with CMF and CMF's clients. Confidentiality, availability and integrity of information Policies and directives pertaining to management of information security, including codes of conduct. Employee training and Declaration of Compliance and Confidentiality signed annually. Conduct annual employee awareness campaign on information security. Unforeseen events could hamper ability to provide customer service and fulfill the organization's mission. Business continuity plan tested and revised annually. Annual training program. Ensure continuous improvement of business continuity plan. In 2010-2011, the Board conducted a performance review of its members and its committees in compliance with the Board Performance Assessment Policy. For fiscal 2010-2011, an expense of $0.1M was incurred for director participation in (and preparation for) Board and committee meetings. Director remuneration is based on the Board's Remuneration and Compensation Policy which provides an annual honorarium for the Chair and a per diem for the Chair and directors preparing for and attending Board/committee meetings. Each year, the Board assesses the Executive Director's performance in compliance with performance management program guidelines issued by the Privy Council Office. These guidelines, among other things, call for the implementation of a performance agreement and fixed performance objectives. The Executive Director's remuneration is established in compliance with Privy Council Office policy and guidelines. Telefilm has identified training needs according to its new leadership model. Specific training has been provided to employees in relation to time and performance management, communications and reinstatement of employees after extended absences. Regular forums have also been held to respond to specific managers' needs. Telefilm continuously communicates with and solicits feedback from clients, partners and key stakeholders through various means. Telefilm held its second annual public meeting in Halifax, Nova Scotia on December 8, 2010. Telefilm's achievements of the previous fiscal year were presented to over 325 participants who attended either in person or via live webcast. It enabled members of the public and representatives of the audiovisual industry to interact with Telefilm's Board members and directors. 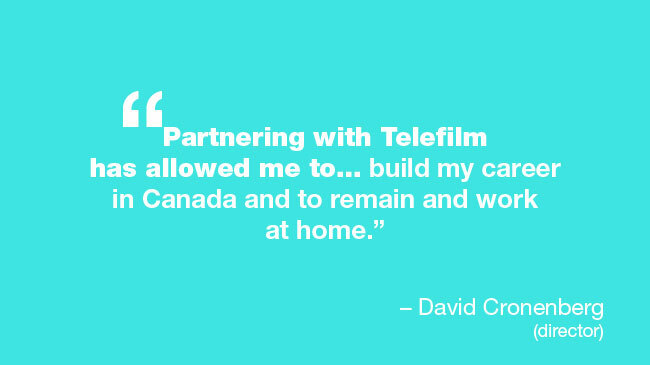 Throughout 2010, Telefilm's Executive Director met with over 175 stakeholders across Canada in an industry-wide consultation. The results of this consultation proved crucial for structuring Telefilm's new corporate plan. Canada Feature Film Fund Working Groups (CFFF WG) provides a forum to discuss needs, challenges and objectives of the industry. Its mandate is to provide guidance and feedback about Telefilm's programs. The CFFF WG has representatives from various industry groups, unions, guilds and associations. In 2010-2011, two meetings and several subcommittee meetings were held for each linguistic group. 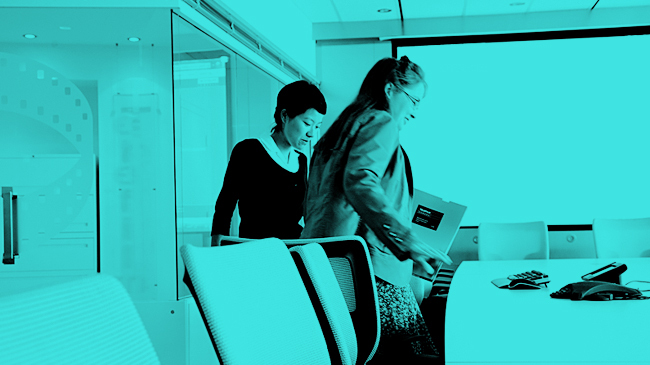 International Business Development Group (IBDG) develops and implements strategies that help the Canadian audiovisual industry become more internationally competitive. Members of the IBDG include provincial agencies, industry associations and the Canada Media Fund. The IBDG met formally four times this fiscal year. The Board of Directors adopted a Conflict of Interest and Post-Employment Code for employees and senior managers. Each year, Telefilm employees must declare that they are in compliance with the Code. During fiscal 2010-2011, presentations were made in every office to remind employees of their ethical obligation. Board members are subject to the Conflict of Interest Act as well as to Section 5 of the Telefilm Canada Act. If a member were to have a material interest in a contract with Telefilm that was not covered by Section 5, he or she would be required to declare such interest, as per the provisions of Telefilm's Bylaw 1, which contains a declaration-of-interest mechanism. To ensure the highest degree of transparency, members are required to submit a written statement to the Chair each year disclosing any situation that may contravene Section 5 of the Telefilm Canada Act. Telefilm is subject to the Public Servants Disclosure Protection Act. This Act advises employees about the correct procedure for reporting unethical or illegal behaviour they may witness in the workplace. As a small organization, Telefilm is eligible for an exception that permits such reports to be made directly to the Office of the Public Sector Integrity Commissioner of Canada. This year, all employees attended presentations about the Act and its procedures.